And another year goes by… Happy New Year! Here is my annual Top 10 list for 2013. As in previous year’s lists (2012, 2011, and 2010) there is a lot to talk about, so here we go. Q4 2013 was a busy time for us. Microsoft released their Windows 2012 R2 update along with Visual Studio 2013 and updates for ASP.NET and ASP.NET MVC. We have always done our best to keep up with all the new Microsoft technology releases, so we quickly refreshed to Windows Server 2012 R2 for our hosting platform and launched support for ASP.NET 4.5.1 and ASP.NET MVC 5. Our hosting platform is Visual Studio 2013 ready! Along with Visual Studio 2013, Microsoft released Team Foundation Server 2013. So we launched support for shared TFS 2013 hosting in our US and UK-based data centers. TFS 2013 adds more collaboration tools like Team Rooms, has enhancements to improve productivity like un-dockable details panes, and includes GIT integration. We posted a Getting Started with TFS 2013 Hosting video. In May we unveiled Snapp – a .NET platform-as-a-service solution that comes with a staging and production site for each application. Snapp is built on top of Windows Azure Pack – the same technology that runs Windows Azure. The Snapp service is currently in free beta mode so interested developers can sign up and test it out and provide us with feedback. Over the year we’ve launched some enhancements including hostname support, scheduled deployment, an asynchronous task notification alert system, and enhancements to the exception management system. With huge companies like Amazon moving into the hosting space, smaller independent companies like DiscountASP.NET find it increasingly more challenging to fight for mindshare. 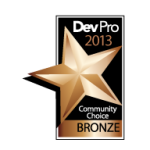 But despite the entry of the giants, for the fourth year in a row, we’ve placed in the top 3 for the award for Best Hosting Services in DevPro’s Community Choice poll. Thanks for your votes, and for your continuing support that allows us to remain independent, agile and responsive to your needs. We expanded our activity on the Google+ platform in 2013, hosting a few Google Hangouts and going live with our own Michael Ossou conducting some great Google-on-air interviews with top-notch developers like Chander Dhall, Scott Allen and Dan Wahlin. Add us to your circles! If you aren’t on Google+, you really ought to check it out. We partnered with TeamExpand to offer a fully-managed hosted TFS Timesheets solution. TeamExpand’s TX Chrono application installs on top of TFS and is a web-based tool that allows developers to submit Timesheets for project work items and provides project managers with the ability to review and approve Timesheets. We launched SQL 2012 Reporting Services as a new add-on option for our hosting customers. Some of you asked if it was possible to use just the build portion our TFS service. The idea (and challenge) intrigued us, so we created and launched a standalone TFS Build-as-a-Service solution. If you host your TFS repositories on-premises or at other TFS hosting services but require a customized TFS Build solution, our Build-as-a-Service is right up your alley. The Build solution is fully-managed and customizable. We can support FTP or WebDAV access and install code signing certificates and customized test frameworks. You can install Web Deploy and deploy straight from the build server. We can support complex build solutions that require multiple build servers and multiple build agents – in other words, all the flexibility of a custom build environment with none of the maintenance headaches. I mention this every year as an accomplishment because in recent years it has become increasingly difficult to attain Microsoft Gold Partner status. While we’ve seen other Gold partners drop by the wayside, we’ve been able to maintain our Gold status for eight years running. Every year is a challenge and we’ll continue to do our best to maintain our Gold status. We truly enjoy helping the development community, so as you may know, we offer a lot of free beta hosting programs. This year we worked with Microsoft to offer free hosting sandboxes to allow developers to test out new technologies like ASP.NET 4.5.1 on Windows 2012 R2 and Web Matrix 3. We will continue our tradition of offering beta hosting via our labs program whenever we can. Would have been nice to “accomplish” having a phone number or some way to contact you for human assistance and not canned email answers. Hi John, it looks like you opened a ticket telling us you’d updated your credit card information in order to make a payment, and you received a reply one minute later saying the payment was taken care of and your site was back up. You probably would have waited longer on hold to speak to someone in billing than it took to get the problem solved via email in this case. I’m not dismissing your point, I understand that some people prefer to pick up the phone to take care of things. You’re not alone there and it’s not an unreasonable thing to expect, since most hosts do have phone numbers you can call. We’ve always done things a little differently though, and this article explains our reasoning behind that. The article is geared toward technical support rather than billing issues, but we can’t really have phone support for one and not the other.